2016 is the 400th anniversary of the death of William Shakespeare, so this month we are celebrating all things Shakespeare – the fact that his works are still going strong after 400 years, and indeed remain a perpetual source of inspiration for new work. When we think of Shakespeare do we think of Elizabethan times, the Globe Theatre, conspiracies, modern retellings (books, movies, songs, and plays), the many works inspired by his plays and sonnets, or the new words he coined and left behind? Curious to know more about this man, you can go in search of Shakespeare, the Globe Theatre, or explore Shakespeare; or even explore more of the times in which he wrote and performed. There have been many many works (books, movies, songs, and plays) inspired by Shakespeare – whether a reworking of an original play or sonnet, or the exploration of a character or idea. He drank and saw the spider by Alex Bledsoe is a compassionate retelling of The winter’s tale, Wyrd sisters from Terry Pratchett retells Macbeth, and Station Eleven by Emily St John Mandel shows the plays of Shakespeare lasting when not much else does. If you have not yet discovered William Shakespeare’s Star wars series, a joy awaits you. Try out the William Shakespeare Star Wars sonnet generator. 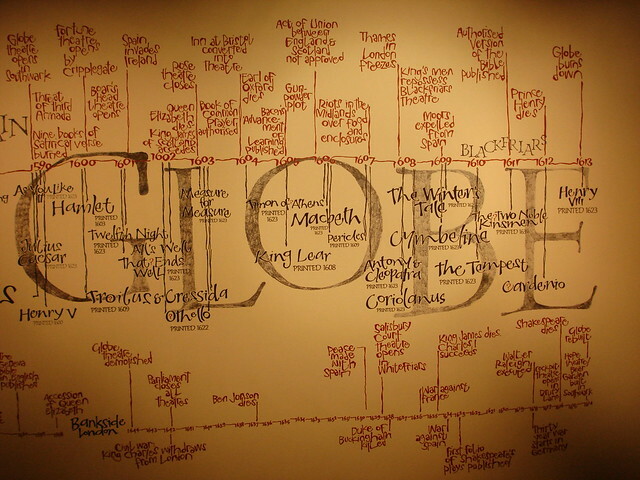 There are ever growing lists of novels inspired by Shakespeare and films and even more films. Doctor Who meets with Shakespeare and JK Rowling allusions are included as well. Star Trek and science fiction are also heavily influenced. The Will Speak machine in some of Jasper Fforde’s writing are just some of the allusions to Shakespeare (if you want to see a comprehensive list for The Eyre affair, follow this link). Goodreads has a delightful list of Shakespeare retellings. While some films are quite obviously inspired by Shakespeare, have you stopped to consider West Side Story, The Lion King, 10 Things I Hate About You, A Thousand Acres, My Own Private Idaho, Big Business, and Forbidden Planet as reworkings of Shakespeare? What about Kiss Me Kate, Deliver Us From Eva, Were The World Mine, Get Over It, or She’s The Man? Gnomeo and Juliet anyone? Have you ever wondered that Sons of Anarchy so closely resembles some key elements of Hamlet? Even Doctor Who visits Shakespeare on more than one occasion (okay, there are aliens and monsters involved). Then there is the music inspired by Shakespeare. Songs which capture the heart and imagination. But perhaps what sets Shakespeare above all others is the legacy of words he has gifted to the modern world. Do you know these everyday phrases that came from the bard? Or these? Do you ever think woe is me? Are you stony hearted? Have you been on a wild goose chase? Do you wonder what’s in a name? That which we call a rose by any other name would smell as sweet? Do things vanish into thin air or do you wear your heart on your sleeve? Do you ever think we few, we happy few, we band of brothers? Or do you give short shrift to these ideas? Are you ready for a sea change? Or would that be without rhyme nor reason or it is the be all and end all? Thinking about all that is going on, we have seen better days. But there is no need to get up in arms as truth will out. Can you have too much of a good thing? What things do set your teeth on edge? Hopefully you are not yet ready to shuffle off this mortal coil, or is that a foregone conclusion? Should you stiffen the sinews or send him packing? It could be high time to avoid the green eyed monster, and say good riddance to foul play. In the twinkling of an eye, as good luck would have it, and sharing the milk of human kindness it is such stuff as dreams are made on. Indeed, the game is up for star crossed lovers because the course of true love never did run smooth. If you are as dead as a doornail, as merry as the day is long, as pure as the driven snow, in a pickle or in stitches, or the game is afoot you can thank Shakespeare for these and many other phrases. We may have gotten a little carried away there, please forgive us, but do celebrate with us the wonder and delight that is Shakespeare! There will be a twitter discussion on 26 April starting at 11am and 8.00pm Australian Eastern Daylight Savings (Summer) Time. 6.00pm Singapore Standard Time, 12.00 noon Central European Summer Time, 9am – 11am; 2pm – 4pm; 6pm – 8pm BST (UK). Note this is a staggered discussion. Please use the tags #bardread and #rwpchat as you discuss your reading, watching, and playing that is your experience of #bardread, so that others can join in the conversation too.